Pat Binder & Gerhard Haupt: In your work Machine Désirante for SB13, you chose to explore the infrastructural development of Sharjah. How did you come up with researching the early stamp design and production in the Emirate, and which were your findings and conclusions which you are drawing the attention to in your piece? 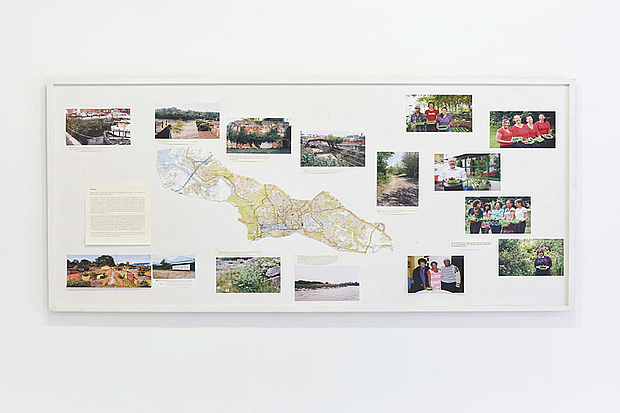 Maria Thereza Alves: Christine Tohme's Sharjah Biennial concentrates on four areas of research for newly commissioned works: earth, water, crops and cooking. I am not a cook and I have previously made several works on water and seeds, so I decided to look into what to me is a new research field: infrastructure, based on the marvelous essay “The Politics and Poetry of Infrastructures” by Brian Larkin, suggested to me by Lara Khaldi, co-curator of SB13. I traveled to Sharjah to research infrastructure and met with officials and visited the sites of SEWA [Sharjah Electricity and Water Authority], Bee'ah (waste management), and Etisalat, (the communications network). But it was stamps which intrigued me. Having never studied them, I met with Moutaz Mohammed Othman, president of the Philatelic Society in Sharjah, and author of the book “Tarekh Tawabee al Emirate” who explained the regional history of stamps. The infrastructural accouterments of a nation state include its postal system. 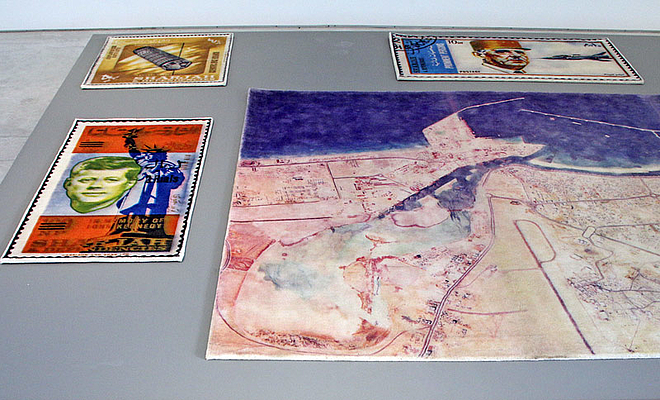 In the case of Sharjah and of some of the other emirates, the American entrepreneur, Finbar Kenny, took over the postal franchise and became responsible for selecting the images printed on the postage stamps. The selection of the images for this work includes a skier from the Winter Olympics at Grenoble in 1968, President de Gaulle and a fighter jet, satellites, an American cowboy, the World Fair in New York in 1964, and President Kennedy. These stamps issued in the 1960s-70s, reflect the aspirations for modernity and a Western idea of progress, much similar to the situation of my own country, Brazil, during the same period of time. These aspirations continue to direct our desires in the construction of a future. The resulting work is Machine Désirante (Desiring Machine), a concept from Deleuze and Guattari which celebrates the potentialities that can be unleashed from desire which includes incorporating appropriations. Machine Désirante is an investigation of the formation of visual identity in Sharjah, and therefore also of the idea of the future in Sharjah around the time of its independence. Pat Binder & Gerhard Haupt: In the conversations and panel discussions of the inaugural days of the Sharjah Biennial, your long-term project Seeds of Change was referred to with admiration many times, and it is also noticeable that it has inspired the work of several of the participants of this Biennial edition. It would be very interesting for our readers if you could explain this project briefly, taking as example the research and work you did in Dubai in 2015. Maria Thereza Alves: I began Seeds of Change in 1999 after a conference I participated in Finland with scientists and artists, and where I saw some tools used in botanical research. I then learned about the project of the botanist Dr. Heli Jutila, who has written the only study on ballast flora and has developed methods for locating, identifying and germinating the archaic seeds of the ballast flora. Seeds of Change is based on original research to unearth historical ballast sites and ballast flora and their possible involvement in the construction of landscape. Works have been developed for the port cities of Marseille, Reposaari in Finland, Bristol, Exeter/Topsham, Liverpool, Dunkirk and now, New York. In Dubai, I became interested in tracing the possibilities of how seeds could have arrived in the city and therefore the work went beyond the port and became the multi-media installation Wake: Flight of Birds and People, a commission for Al Serkal. This work is based on extensive research, and talks with botanists, historians and researchers. The sand on which Dubai is built upon is constantly moved or moving; piles are shifted from one area to another for construction. And most importantly, the wind ̶ the winds that come from Iran, Afghanistan and Pakistan and also Syria and Jordan ̶ brings seeds and cause yet further movements. Each movement results in historical complexities of inclusiveness of the history of neighbors and others. In Dubai, where four out of five inhabitants are not native, a wonderful complexity of histories which might lead to the arrival of seeds is possible. Dubai and nearby oasis are places which have long and varied histories: trade, wars and invasions, chance meetings, the gift of a horse, unpacking of a suitcase or a sand grouse stopping for a drink at an oasis that happens to be on a major caravan route, or an accountant from China arriving for an international conference in Dubai. These astounding movements and migrations contribute to the arrival of seeds in Dubai. As a result the work is titled Wake: The Flight of People and Birds. The indoor installation consisted of drawings, images, texts and a garden of non-native plants but which are considered to be part of Dubai today. 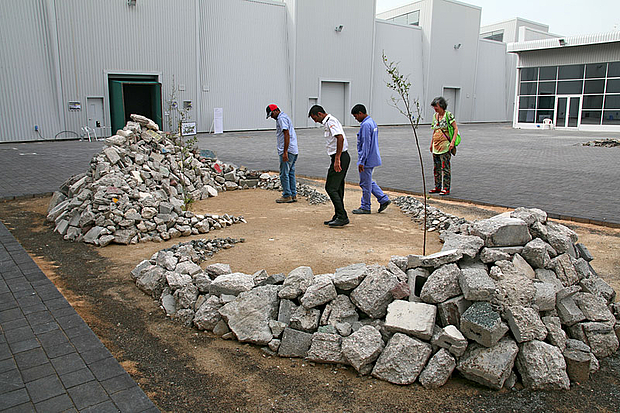 In the outside space at Al Serkal was the Seed Catcher, a living sculpture made with rubble from the port in Dubai. It was in the form of dunes in order to provide a shelter for seeds to arrive and perhaps stay and germinate. Wake: The Flight of People and Birds will be exhibited at the NGBK Berlin and Galerie im Körnerpark in November/December 2017, in a group show curated by Antje Weitzel. In these works, I am interested in seeds not so much as a metaphor but as witnesses to histories that might appear random but in reality reflect economic policies, migrations, trade, movement by animals and birds or the wind. They are witnesses that crop up in our cities, around any corner and are testimonies to a complexity of history that we usually do not consider. Pat Binder & Gerhard Haupt: You have been awarded the Vera List Center Prize for Art and Politics 2016-2018, and the jury highlighted this work series as well. For the show in New York related to the Prize, you are already researching and developing a new project - which will be the first of this kind that you will be doing in the Americas. What new aspects are you focusing on in particular? Maria Thereza Alves: I am very excited about this new work. Thirty percent of Manhattan, south of City Hall, is made from landfill, some quantity consisting of ballast material, in many cases arriving on mercantile sailing ships from Europe, some as a result of the Atlantic Triangle Trade which also included enslaved Africans. For example, coralline sand would be coming as a result of the trade via the Caribbean. I have compiled a list of about 450 ballast plants –that is seeds which arrived with ballast and then germinated– which have been historically cited by botanists in the late 19th century. And it turns out that whenever people were transported on sailing ships, ballast was necessary to counterweight the movement of bodies on board –and we know that millions of immigrants, some forced and enslaved– arrived into the harbor of New York. I am interested in how the topography of New York has drastically been transformed through the colonial process, and how these ballast plants are indicators that you are not in New York, but perhaps in Kragerø / Norway, or Bristol / England. The work will be exhibited in the Parsons’ Arnold and Sheila Aronson Galleries in New York, opening in early November. Pat Binder & Gerhard Haupt. Publishers of Universes in Universe - Worlds of Art. Based in Berlin, Germany. * 1961 São Paulo, Brazil. Lives in Berlin, Germany.